So what were the chefs up to? Last night at City Winery -- and then Bleecker Heights Tavern and then the Spotted Pig -- Food & Wine Best New Chef alums including Daniel Boulud (88), Terrence Brennan (95), and an on-crutches Tom Colicchio (91) turned out to celebrate the announcement of the 2009 class; though an old man in the company of his fellow honorees, Paul Liebrandt, was the hometown winner and de facto elder statesman of the group. A full band played "This Is How We Do It." but nothing lubricates a room full of food folks like three open bars and not enough food to wash it down. So what were the chefs up to? Terrence Brennan was all smiles about his new venture, Bar Artisanal, taking the Trigo space. He told us he had met with the owners before the restaurant first opened and would have liked to turn the space into his casual concept Artisanal Table but the design was too far along. He's continuing the search for a smaller space -- 3,000 square feet, please. Michael Psilakis (08) plated a blood-orange trio with his son Gabriel comfortably perched on his shoulders. This was the marketing stunt of the night, by a margin: Psilakis' new gastropub is named Gus & Gabriel's, after all. Speaking of little Chef Psilakis Jr., he was spotted at the Aureole table devouring one of Chris Lee's (06) rabbit agnolotti with aged Pecorino, sunflower seeds, red-ribbon sorrel, and Madeira emulsion. Yes, we can expect this on his new menu when the place opens, according to an over-boozed Lee associate, in May. Though signage clearly indicated the party was for the Best New Chefs, this didn't stop Top Chef contestants from descending on the place in droves. Hosea, far and away the most over-dressed man in the room with a suit and tie, introduced himself to David Chang (now with a full head of hair), who apologized but said he didn't watch the show. "It's optional," Hosea conceded. Speaking about the venues for a quick sec, it's not immediately clear how City Winery, which is massive, can outlast this economy, but let's hope it does. Bleecker Heights Tavern, on the other hand, is pint-sized and accessed via a burger joint. 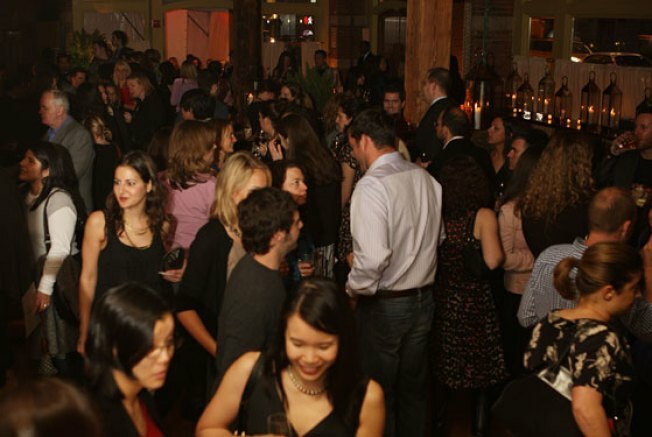 It might be the perfect venue for 2009 (if not 100 percent too small for a Food & Wine event). Paul Liebrandt has known about the award for a month and hopes it will expand his audience outside of New York. He was last seen holding court at the Spotted Pig at 1:00 a.m.